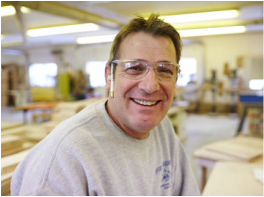 Joy Valley proudly employs some of the most talented cabinetmakers and finishing experts in Maine. Our products are distinguished by superior quality, outstanding craftsmanship and careful attention to detail. Instead of using a production line, every Joy Valley product is built by the same woodworker from start to finish. In turn, our woodworkers take great pride in each and every product they build. ﻿Contact us today﻿ for more information about our cabinetmaking and finishing services.